"We are American citizens. We own this house. They can do nothing to us now. " When I told people that I was interested in watching this 2003 Oscar-nominated drama, they said, "uh, why?" I didn't really have an answer except that I basically wanted to see what all the hoopla was about during awards season. The movie kinda drags in the beginning, but it recaptured my attention with the pitch-perfect performances of both Ben Kingsley and Shohreh Aghdashloo. House of Sand and Fog is about just that--a house, of particular significance to two people for two totally difference reasons. 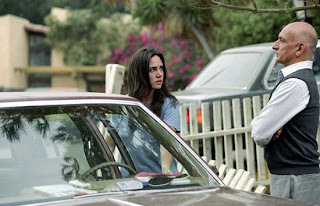 For Kathy, played by Jennifer Connelly, this is the house she grew up in, the house her father left her and her brother in his will, and the house she just lost due to bad taxes and a bad decisions. For Behrani, the middle eastern man who fled his country with his family to make a better life for them, the house represents the opportunity to start fresh and embark on a new foundation. While Kathy struggles to regain a grip on her old life, back when she was happily married and sober, she becomes obsessed with getting her old home back and pleads to Behrani to give it back to her. Naturally Behrani doesn't obliged, which only drives her crazier. Things go horribly awry from there, with Behrani becoming obsessed with not letting the home slip out of his grasp, eventually losing sight of what really mattered. Even though the home does not belong to Kathy anymore, she felt a sense of entitlement for it, coming and going on the property whenever she pleases and harassing the new owners to give it back. I was ready to fight when the cops started treating the new owners like visitors, and not the American citizens they were. They were constantly treated as lesser, even though they were working, tax-paying citizens of America. That rubbed me the wrong way. I felt more empathy towards Behrani, than the booze-filled grief-stricken ex-tenant. What did you think? that movie was interesting, but so very depressing! honestly, I still can't get the image of her stepping on that rusty nail out of my head...although I'm fully aware that the filmmakers never actually showed it. yikes! GIRL...I had to watch this for a film class that discussed the issues of race in America and the professor had to CONSTANTLY remind me to remain objective during viewing. It was an excellent depiction of the kind of De facto prejudice that affects naturalized citizens of this country and the sense of entitlement that natural born citizens exhibit. Just the title alone explained Kathy's hold on the house..it was a tangible as sand and fog...both slipping through her fingers!